Dermablend Corrective Fluid Foundation 16 hr: I'll start by saying that high coverage foundation is not something I would wear on a daily basis, however there are certain occasions that call for it. For anybody with blemish or acne-prone skin, a high coverage base is probably a daily essential and I think there are times that we all need one so it's great to find one that provides the necessary coverage, but without looking like a mask or feeling heavy on the skin. I was really surprised by the lightweight texture of this foundation and expected the coverage to be medium at best, but it is very full coverage. It can be built up, if necessary, without looking cakey and is extremely long-lasting - it really doesn't budge on the skin at all. What I particularly like about this foundation, is that it makes my skin look extremely smooth and even in texture. It contains SPF 35, which means that it isn't suitable for flash photography. I actually didn't find it drying, which surprised me because usually long-wearing foundations are. I personally like to use a glow-giving setting spray with it to add some luminosity because that's my personal preference when it comes to how my base looks. Overall, I am very impressed. Dermablend Covermatte Compact Powder Foundation: This is a new addition to the Dermablend family. Powder foundations are not suited to my dry skin type so I haven't been able to give this as good a test as the fluid foundation, however for oily or acne-prone skins, this would work well. It contains salicylic acid, which is an oil soluble beta-hydroxy acid, meaning it can really penetrate the pores, thereby treating the skin as the same time as covering it. There is a sponge included in the compact and by using that, high coverage is achieved but a buffing brush could also be used. This compact is slim and would be ideal for touch-ups on the go. It contains SPF 25. Dermablend SOS Concealer Stick: This concealer is newly formulated and again, is one that surprised me because it is very high coverage, yet really creamy and not drying. This will literally cover any blemish or angry spot, areas of redness and dark circles. I don't have any tattoos but imagine that it would be able to cover those too. I have very dry skin, particularly in my under eye area so stuck to mainly using it on other areas of my face but if your skin isn't as dry as mine, this concealer would work really well on all areas of the face. It has a very creamy texture, yet it doesn't crease or slip and slide on the face. It is described as being sweat and waterproof but I haven't been able to test those claims - I will definitely be bringing it on my next holiday though! If you want full coverage without the heavy feeling on the skin, I highly recommend trying this concealer. Dermablend Setting Powder: Because I have dry skin, I was quite wary about trying this powder but as soon as I saw how smooth it made me skin look, I was hooked. I as also worried about it leaving a white cast on the skin as it is pure white in colour, but it doesn't look white on my skin, although I am unsure how it would look on dark skin tones. I dust a very small amount over my foundation to set it and the overall finished look is very polished. I would imagine that on oily skin, you could use more than a fine dusting and it would keep your skin looking matte but not cakey. Overall, this range has really impressed me and some of the products will be my go-to for days when my skin is not looking its best or I need it to last a long time. I like the monochrome packaging and prices are pretty good. 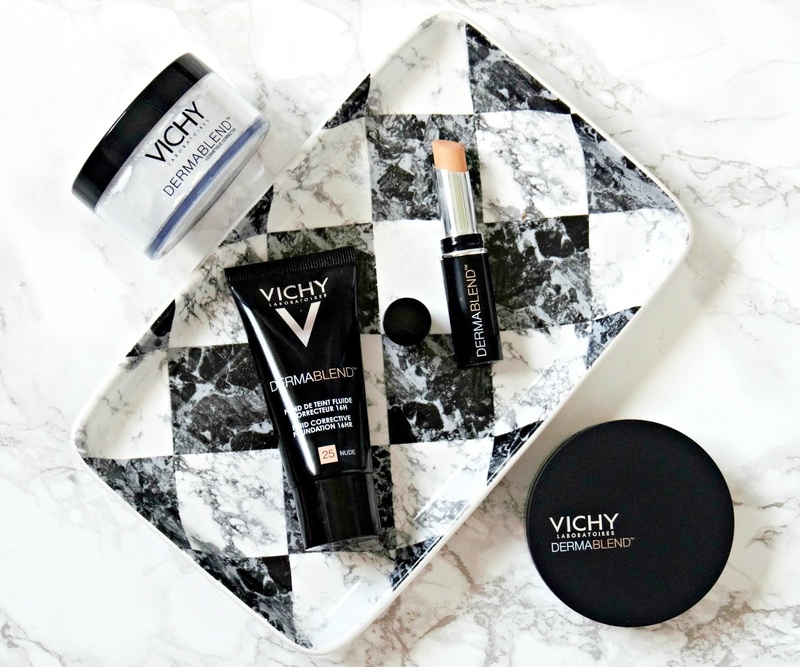 The entire Vichy range is currently on offer on Escentual with a 33% reduction. Have you tried any of these products or are you tempted to? I'd love to hear your thoughts! All products are bought by me, unless otherwise stated. These Vichy products were set to me. Opinion is always my own.